Brought to you by: typewriterdatabase.com • The Typosphere. 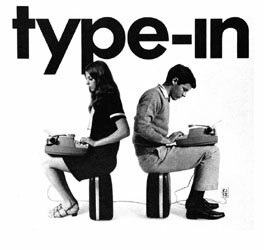 This image from Smith-Corona advertising during the 1960's is probably the earliest reference to the idea of the Type-In, the practice of gathering together with our typewriters and celebrating our machines and what we create with them. The New York Times records that Mike McGettigan's First Philadelphia Type-In on Dec 18, 2010 was the beginning of modern Type-Ins. Since that time, there have been Type-Ins held in several states of the Union and in countries all over the globe. If you'd like to know even more about the history of the modern Type-In and how you can hold one yourself, consult Phillytyper's advice here. The term "Type-Out" was coined by Tom at Cambridge Typewriter in MA to refer to the practice of having a Type-In outside in the sunshine. The first such Type-Out was held in front of Cambridge Typewriter on Oct 22, 2011. Notice: This site documents the beginnings of the Type-in movement from 2010 to 2015. In 2015, Type-Ins got so popular that I could no longer keep up with the new announcements while also administering TWDB and other projects I have going. For now, this site is an archive, but I'm hoping to interest an organization like ETCA or another typewriter collecting group in taking over the project so a more social media savvy person than myself can really keep track of all the Type-ins happening in the world. We'll see how that works out, as it can be tough to find just the right, motivated person to handle something that can get as busy as this worldwide phenomenon is becoming. I'll keep you posted. The First Philadelphia Type-In was the first organized Type-In, held on Dec. 18, 2010 and organized by Michael McGettigan. There was a Type-In at Velo Cult in Portland, OR. on April 5, 2014. There have been a few others that probably have escaped my memory.